Reduced Risk of Wrist Extension - The RGB Backlit Wireless Multi-Pairing Keyboard for PC presents a low front profile which means that there is not a significant difference between keyboard height and the work surface. For users who "rest" the heel of their hands when keyboarding low profile can reduce the risks associated with wrist extension. Learn more about Wrist Extension. Reduced Risk of Shoulder and Back Pain - Keying on laptops requires users to position their hands unnaturally close together. This requires them to roll their shoulders in and usually also down. This puts undue strain on both the shoulders and the upper back. Extended use of devices requiring this posture can have a noticeable effect on the health of the shoulders and back. 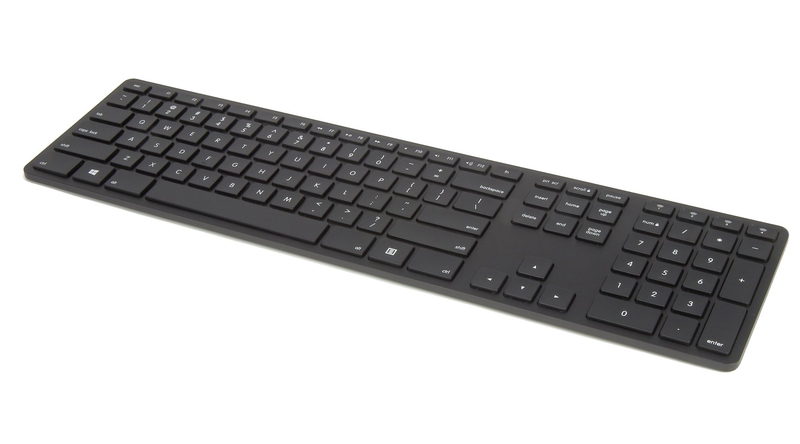 The Backlit Wireless Multi-Pairing Keyboard for PC addresses this by providing users with a means of entering data on these devices without the space limitations of the device screen. 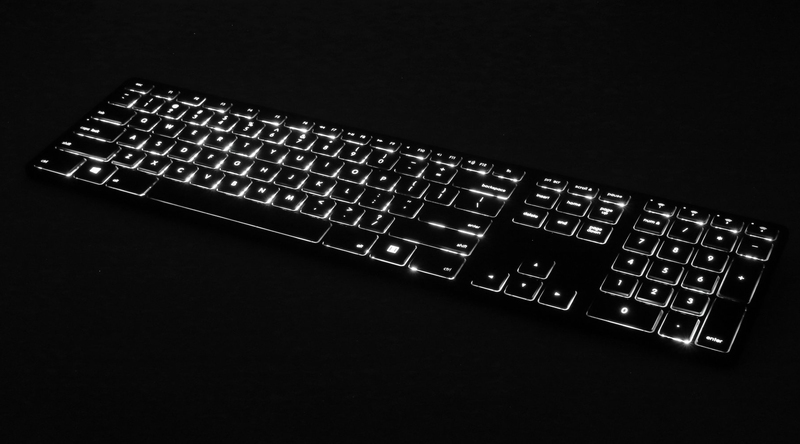 Backlighting with Own Dedicated Rechargeable Battery: The Backlit Wireless Multi-Pairing Keyboard for PC has variable intensity backlighting for any light conditions from daytime and full-light to complete darkness at night. The backlighting has its own dedicated 1,400 mAh rechargeable battery so that, even if the backlighting power runs out, the keyboard will continue to function as normal. Light intensity varies in 10% increments, form 0 to 100%. Time between charges will vary with the intensity and duration of usage of the backlight. 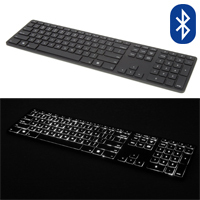 Bluetooth Connection: The Backlit Wireless Multi-Pairing Keyboard for PC employs Bluetooth for its wireless connection. This ensures quick connection to paired devices regardless of the operating system. Multi-Pairing Devices: The Backlit Wireless Multi-Pairing Keyboard for PC allows users to pair up to 4 Bluetooth devices to the keyboard at the same time, making it easier to switch between the four devices with the simple press of a button. Low Profile Design: The Backlit Wireless Multi-Pairing Keyboard for PC employs a "chiclet" or "island" keycap which permits a very low profile. The profile tapers from 3/4" at the back to just 3/8" thick at the front, presenting a slightly angled profile to the user. Familiar Design: Apple users will appreciate the familiar design. 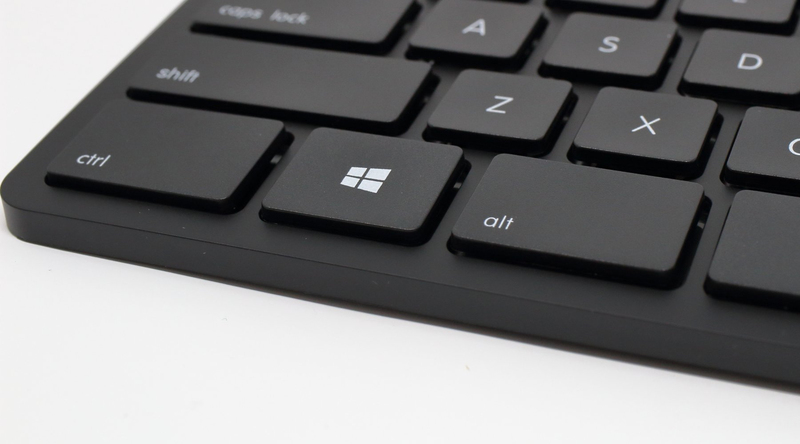 Plastic Housing: The upper housing on the Backlit Wireless Multi-Pairing Keyboard for PC is made of plastic, which keeps this keyboard budget-friendly.